A pack of wooden heart shaped embellishments, five each of nine different designs. 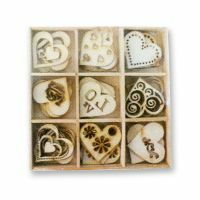 The hearts are lightweight so perfect for use with papercraft projects such as cardmaking, scrapbooking , giftwrapping etc. Use them as they are in a natural wood finish of colour them with ink pads or Pro Markers for different effects. The hearts measure approximately 3 x 3cm or 1.25 x 1.25 inches. Don't forget you can create something lovely from the empty box too here's an example.